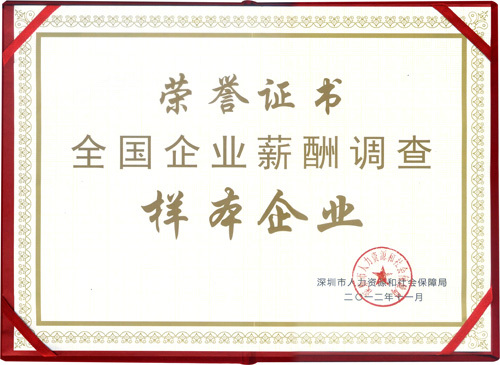 Recently, KTC was awarded “National Enterprise Salary Investigation Sample Enterprise”, issued by Shenzhen’s bureau of human resources and social security, to honor our setting up of salary and welfare system and the contribution that we made for setting up a database. Our employees’ salary and welfare are in strict accordance with government regulations, up to or better than standards, to ensure employees can obtain fair and reasonable salary according to their mental and physical labor, and raise their living standards. This time, the assistance for setting up a database for Shenzhen enterprise salary and labor cost sampling survey has a great guiding significance to establish salary system, assist compensation structure and optimize salary administration. Through this investigation, it can reflect our employees’ salary and welfare level correctly, and also, help us establish a good enterprise image and maintain sustainable development.